Stitch by Stitch, creators of handmade textiles from India and Nepal, present an installation as part of the Brompton Design District programme under the theme ‘Material Consequences’. Located at no 197 Brompton Road, ‘From Rain to Loom’ highlights the Khamir Kala Cotton Initiative which is a reinterpretation of an old craft value chain reconfigured for the modern marketplace, and Stitch by Stitch’s work with this material. ‘Chai Hour’ every day from 16:00 – 18:00: drop-in for authentic Indian chai, supplied by Tea India! ‘From Rain to Loom’ will be an immersive environment in which the visitor can learn about the ancient, genetically pure species of drought resistant kala cotton, alongside Stitch by Stitch quilts, cushions and other textiles made in this organic material. Indigenous to the Kutch region of India, an area famed for its hand weaving, kala cotton is watered only by rainfall, and is resilient and resurgent in the face of difficult land conditions and pests. This is in contrast to other genetically modified widespread species of cottons that have been introduced to the region, which require intensive irrigation, synthetic fertilisers and pesticides that also cause high rates of water pollution. The Kala Cotton Initiative has been integral to the resurgence of kala cotton production which is sustainable environmentally, but also beneficial for the local economy. Relying on imported raw materials exposes local businesses to peaks in prices, and growing cotton species which require additional irrigation further contributes to water scarcity, when over 100 million in India do not have access to clean water. “The cultivation of indigenous Kala cotton in this dry, arid region, is a holistic choice. for marginalised farmers, spinners and weavers. Kala cotton has the deepest roots of all cultivated cotton species, and is able to withstand long periods of drought which are characteristic of this land. After many years of experimentation by the Kala Cotton Initiative in perfecting spinning and weaving techniques, this coarse, stretchable fibre can now be woven into fine, durable, soft textiles." Raw Chindi quilt and cushions in kala cotton. Driven by sustainable practice and preserving the livelihoods of the skilled artisans, Stitch by Stitch are proud to be involved with the Kala Cotton Initiative. Working with kala cotton allows conscious consumption, and is a very effective way to work towards the reduction of cotton’s water footprint. Khamir works to strengthen and promote the rich artisanal traditions of Kutch, a district of Gujarat state in western India. The organisation serves as a platform for the promotion of traditional handicrafts, alongside the preservation of culture, community and local environments. Its approach is democratic as it sets out to empower people, and to be a place to ferment ideas. 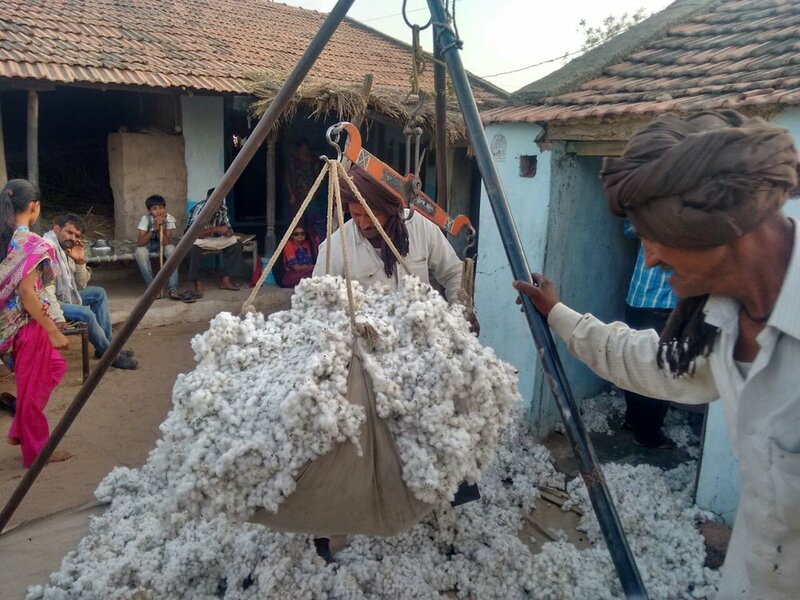 Khamir began this Initiative in 2007, by partnering with Satvik, an association of organic farmers in Kutch, to explore the production possibilities for Kala Cotton. Much research was done in order to develop a process for converting cotton’s short staple length into yarn. Next was convincing local weavers of the value of kala cotton, as it requires changes in the loom set up, as well as differing yields. After years of experimentation and perfecting both spinning and weaving techniques, Khamir began producing its first Kala Cotton goods in 2010. The initiative encourages sustainable cotton textile production in harmony with local ecology. The project aims to create a value chain at multiple levels by working with marginalized communities and promoting locally grown species. To make this work, Khamir and Satvik have created a supply chain between the Kala Cotton farmers, ginners, spinners and weavers to convert the raw cotton into hand woven products. The vision is that the Kala Cotton Initiative will serve as an example for other communities to replicate. Launched in 2006, Brompton established the London Design Festival’s rst Design District. From the outset, it has played host to a pioneering and innovative contemporary programme that has changed the dynamic of the area and earned it a reputation as a leading London design destination. Twelve years on, the programme continues to be a seedbed for experimental design in an area of London known for its iconic, international design brands. Initiated by South Kensington Estates, a company with a history woven into the fabric of the district for over 200 years, together with a cluster of design retailers and local cultural institutions including the Royal College of Art and the V&A, the District was set up to foster a space where new design can ourish. The programme for the London Design Festival, curated by Jane Withers, encourages design that adds meaning and value to our everyday lives. As a platform for emerging designers, it further adds to the energy and dynamism of the area. Thank you to Earthborn paints for supplying Button Tin paint for the exhibition space.